I am looking at meadows in a new light. 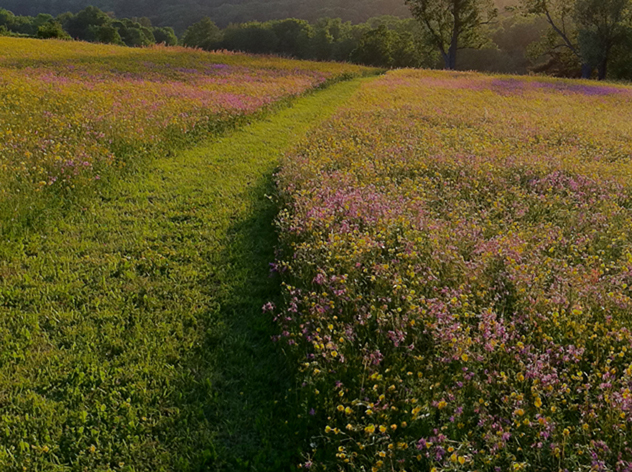 Whether it’s because it was such a bountiful year for wildflowers, or because my wife started mowing a path through our fields last year; meadows have become more important to me. When grass and wildflowers reach their full height, it becomes impossible to go for a walk, especially when it’s wet. Thinking ahead, and with the help of a riding lawnmower, my wife made a double wide path through the different meadows and it’s been great for viewing the incredible display of abundant varied wildflowers that appear in summer. I suspect it has something to do with the fact that when we purchased the surrounding fields three years ago from our neighboring farmer, and while he still hays the same fields that we bought from him, we said we did not want them sprayed with Round-Up anymore. Round-Up is a systemic weed killer that is banned in many states, but sadly, not yet in New York State. 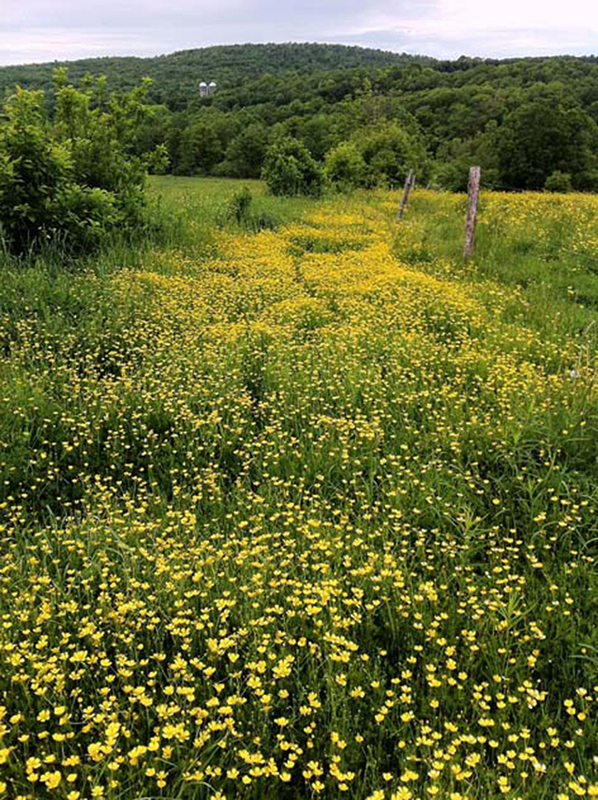 Farmers tend to use it to eliminate “weeds” and, yes, that definition includes wildflowers. The wildflowers and grass provide an important coverage for many birds and animals. Among the birds that nest in the long grass, hundreds of bobolinks return each year to build their nests on the ground in the meadows. And there is a mad rush to raise their chicks before the farmer takes his first cut. If you don’t know the bobolink it is a wonderful species to keep an eye out for. The male birds are “dressed” in what look like tuxedos, but with the white shirt worn on their backs. Sadly, these birds are under threat from rice farmers in the south who shoot them for eating their rice crop, so our northern meadows provide an important habitat for the survival of the species. What can we learn from meadows? And how can we apply that knowledge to create something as beautiful in our own gardens? First of all, Mother Nature likes to repeat the same plants through large areas. No matter where you look — forest, mountains, beach, or along the interstate — under natural conditions plants repeat themselves. At any given time in the meadow there are two to six plants flowering at the same time. In June, the fields are still full of buttercups, but now common vetch (bluish purple), daisy, bedstraw (creamy white) and red clover are starting to flower. In amongst these flowers are meadow grasses and several beautiful native grasses which I have yet to identify. 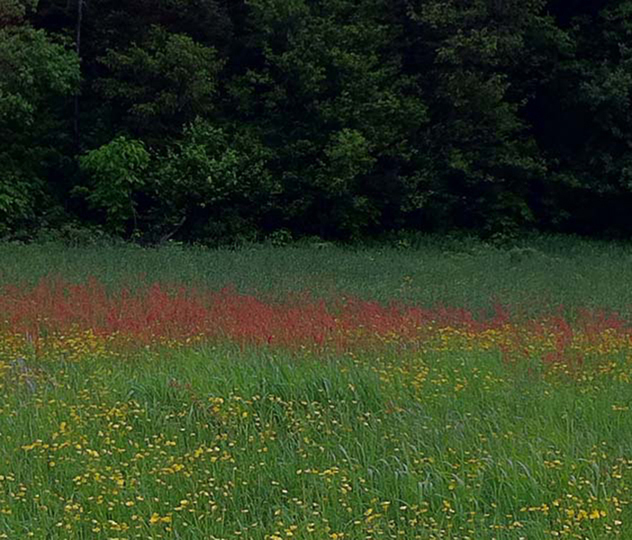 Each of these wildflowers is repeated across the whole meadow in large organic cloud- like shapes. That cohesion and repetition is what is so pleasing; nothing jars, everything flows one to the other again and again. In response to this observation I have left areas in my garden unmown where there are difficult slopes to mow and other areas where I simply want to eliminate mowing. The only maintenance is cutting back the area in the fall with a weed whacker to spread the seeds for next year’s display. Sometimes I don’t even do that because plants will collapse after a few hard frosts and do their own seed spreading naturally. It’s a perfect design solution because I don’t want an overly manicured garden that does not fit with the rural setting. Integrating wildflowers into the garden helps merge the wilder parts of the landscape with the tamer parts. I have used the idea of repetition in every garden I’ve designed, from roof top terraces to gardens that encompass many acres. It does not have to be one plant that is repeated; it can also be the same color of different flowering plants that is repeated which adds a textural element that can be very beautiful and interesting. See photo of the Moon Garden (KL, Fall 2100) which is planted primarily with white flowering plants, variegated and silver foliage plants. 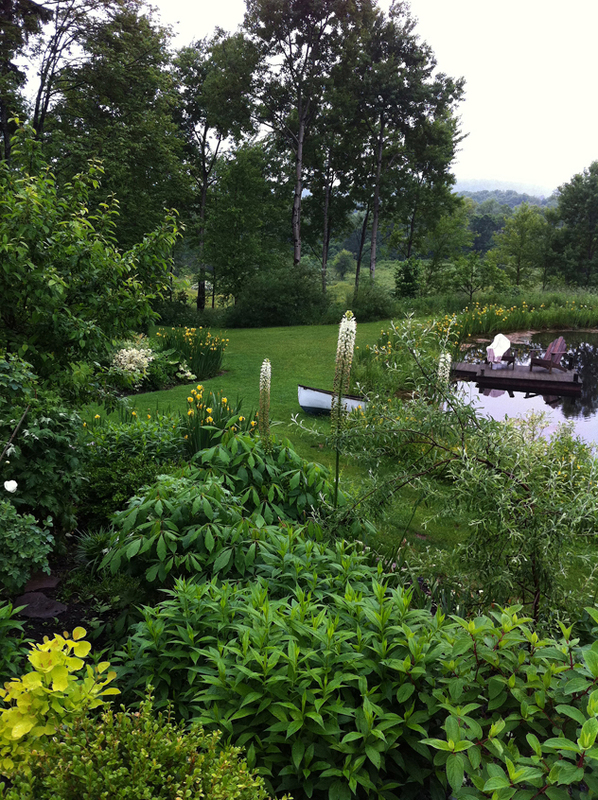 I have purposely planted the native flag iris –Iris pseudacorus throughout parts of the white garden and around the pond to tie the planting together. The repetition of white flowering perennials and variegated foliage hopefully mimics the meadow in its cohesion. I do not want borders that are constantly in bloom; instead, I prefer more intimate “rooms” in the garden that, like meadows, have their season and are then quiet again. A Border Planting Influenced by Meadows. Colias, a.k.a. Sulphurs in North America) floating in pale yellow clouds over the meadows. We have also noticed more pairs of American kestrel. I subscribe to Gardens Illustrated magazine, which features British, American and other international gardens. For several years now the vogue worldwide has been for planting American prairie plants in a meadow-style of planting. 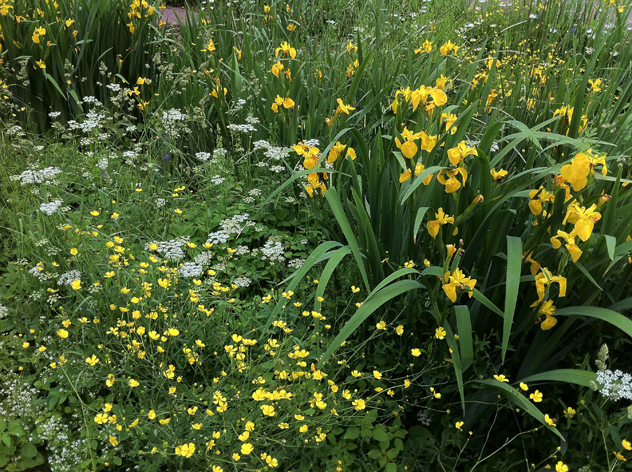 I’ve read several articles about how to create a meadow, which is costly when you consider the work involves digging up a lawn or field and buying expensive wildflower seed mixes. Although I like the brightly colored poppies and electric blue bachelor buttons that are often the choice plants of wildflower mixes, I prefer our native plants such as buttercups, daisy, red clover, sorghum and ragged robin and they are more likely to flourish here (they already do). I prefer the lazy man’s way of making a meadow which is to just stop mowing. In about four to six weeks, the perennials daisies and butter-and-eggs (Linaria vulgaris) showed up in the high grass and in no time I had many of the same meadow flowers in the unmown areas of my once tame lawn. A straight or winding mown path through the meadow plants adds the element of wild and tame which is so pleasing to the eye. On average there is a 35-year seed bank laying dormant in the soil. So, why not tap that free bank and let nature do the rest? By mid July the meadows are now full of native grasses that have bolted a good two feet above the wildflowers. The field of light and dark seed heads sway back and forth on the breeze and at this late stage the meadow has once again been remade. We are just a few weeks away from the last stage of the meadow and that is when the fields are hayed and the grasses (and wildflowers) are made into round bales. My dogs particularly like this stage because they jump up on the bales and have a long view that is unobstructed by the tall grass.